The Ontario government says it will invest up to $1.8 billion for design and construction of the Ottawa Hospital’s civic campus redevelopment project. Of course this investment is essentially a campaign promise, which could be reversed or revised if the Liberals fail to win the June 7 election. (Conservative leader Doug Ford hasn’t said yet if his party would continue the project funding, if elected). 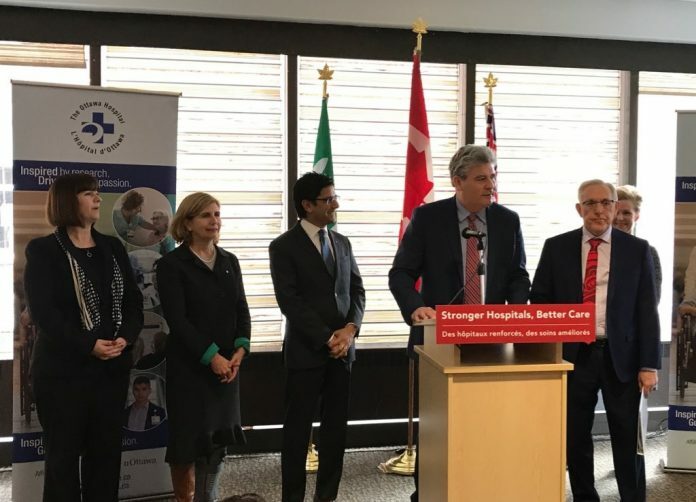 The project is designed to transform the hospital into a 21st-century facility, modernizing aging equipment and spaces and boosting the hospital’s capacity to provide quality care for Ottawa families, according to a government statement. The new civic campus will expand services and provide health care to the region with 1.3 million people. It will provide emergency and in-patient services, as well as other specialty programs including neurosciences, trauma services and vascular surgery, the statement said. The Ottawa Hospital’s new campus will be located on the Sir John Carling site, bordered by Carling Ave. and Queen Elizabeth Dr. The new campus will take five years to plan and design and five years to build, with completion scheduled for 2026. Meanwhile, the Ontario government says in the statement that it plans to invest an additional $38 million in Ottawa region hospitals this year to provide better access to care, reduce wait times, address capacity issues and better meet the needs of a growing and aging population. “A subsequent government doesn’t necessarily have to continue what was in a budget or what was underway,” said Liberal Infrastructure Minister Bob Chiarelli Chiarelli, MPP for Ottawa West-Nepean, at a March 23 news conference to outline the funding. 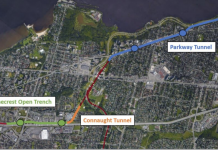 He said as an example that in June 1995 the then-newly elected Mike Harris Conservative government “filled in the hole” after cancelling funding for Toronto’s Eglinton West Subway. The politically-staged announcement where Chiarelli spoke included four other Liberal MPPs, underlying its campaign-style focus. “I wouldn’t expect a lot of governments to do that, but the reality is that a new government can create a budget, they can defer projects, and as I said, they could cancel projects,” he said. Attorney General Yasir Naqvi, Ottawa Centre’s MPP, said the Liberals have chosen to borrow money investments in child care, mental health and health care, including 10 hospitals province-wide (including the Civic campus) that are now in planning or construction – representing more than $10 billion in government infrastructure. The Ottawa Hospital has started a five-year planning process for the new $2 billion super-hospital, with construction proposed to start in 2021. “If we get things right, the new campus of the The Ottawa Hospital will have a bigger impact on our community’s health and health care than any of us can imagine today,” said Jack Kitts, the hospital’s president and CEO. Preliminary plans include an oval-shaped building, underground parking, single-patient rooms and an underground emergency department entrance, according to concept drawings.